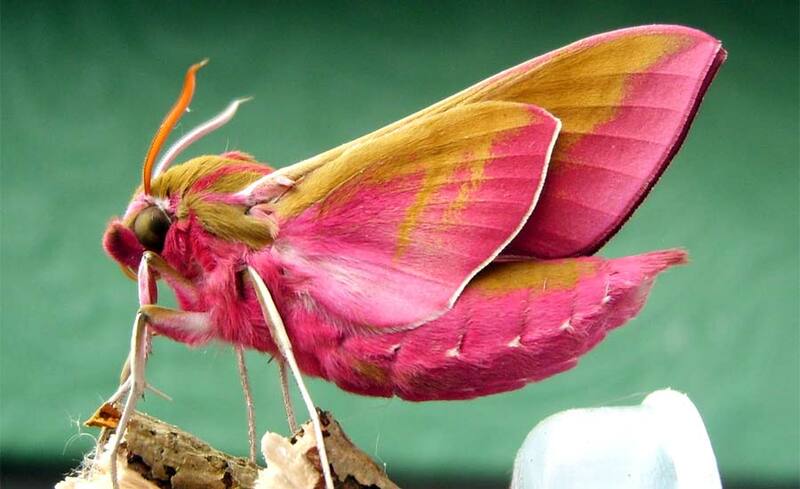 Elephant hawk moth or scientifically called as Deilephila elpenor is a moth in the Sphingdae family. Its common name is derived from the caterpillar’s resemblance to an elephant’s trunk. It is commonly seen in central Europe and is distributed throughout the palearctic region. Its distinct olive and pink coloring makes it one of the most recognizable moths. These moths are nocturnal and therefore feed on flowers that open or produce nectar at nighttime. The elephant hawk moth has incredibly sensitive eyes that allow it to see color even at low-light. In fact, it was one of the first species in which nocturnal color vision was documented in animals. The moth is also known for its hovering capability, which it utilizes when feeding on nectar from flowers. Next articleDancers on a rope! This is called a mirror or sequined spider. These spiders are all members of the Thwaitesia genus. Their most distinctive trait is the reflective silvery patches on their abdomen, hence the common name. The scales look like solid pieces of mirror glued to the spider’s back, but they can actually change size depending on how threatened the spider feels. The reflective scales are composed of reflective guanine, which these and other spiders use to give themselves color. Which is the biggest single celled organism?